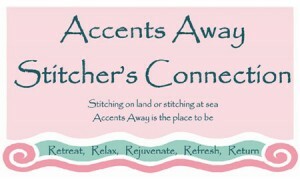 Accents Away Stitcher’s Connection | Accents Inc.
2017 Theme: She sews sea shells by the sea shoreIf you want to escape from the pressure and stress of daily life, Accents invites you to connect with women stitchers for a rejuvenating weekend of camaraderie and friendship. The location is in Bay St Louis, MS. The facility is located just off Hwy 90 near the Bay St Louis bridge. It’s an easy drive from Metairie, LA. The weekend offers an unstructured environment which provides two days for stitching your personal projects. Accents’ staff is available to answer questions and improve your stitching knowledge and techniques through one on one instructions and/or weekend demos. Meals are cooked on the premises and served at 8 a.m., noon and 6 p.m. The sleeping rooms are no frill comfortable twin beds (2 per room), a closet hanging rod and a private bath. The grounds are secluded. If you are interested in attending, contact Accents Inc at (504) 888-2458. We are presently filled to capacity but do maintain a wait list as cancellations do sometimes occur closer to the date. We call interested persons in the order they were added to the wait list. Payments can be made by check or Visa, MasterCard or American Express credit cards. Call or email if you would like to join our wait list.